The designations employed and the presentation of material in this information product do not imply the expression of any opinion whatsoever on the part of the Food and Agriculture Organization of the United Nations concerning the legal or development status of any country, territory, city or area or of its authorities, or concerning the delimitation of its frontiers or boundaries. The mention of specific companies or products of manufacturers, whether or not these have been patented, does not imply that these have been endorsed or recommended by the Food and Agriculture Organization of the United Nations in preference to others of a similar nature that are not mentioned. The views expressed in this publication are those of the author(s) and do not necessarily reflect the views of the Food and Agriculture Organization of the United Nations. All rights reserved. Reproduction and dissemination of material in this information product for educational or other non-commercial purposes are authorized without any prior written permission from the copyright holders provided the source is fully acknowledged. Reproduction of material in this information product for resale or other commercial purposes is prohibited without written permission of the copyright holders. Applications for such permission should be addressed to the Chief, Electronic Publishing Policy and Support Branch, Communication Division, FAO, Viale delle Terme di Caracalla, 00153 Rome, Italy or by e-mail to copyright@fao.org. 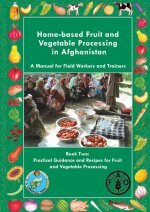 The Manual on Home-based Fruit and Vegetable Processing is composed of two books. This book is designed to complement Book One, "Principles of post-harvest handling, storage and processing of fruits and vegetables", by providing recipes and guidance that will enable you to put into practice the principles described in Book One. It is advised that you start by reading Book One before applying the recipes provided here. You can also regularly refer back to Book One to better understand the purpose of each processing step described in Book Two. Each chapter begins by describing the processing outline for a given technique, and then providing detailed guidance on each step of the process. A colour code and icons will enable you to follow clearly how the process unfolds. Detailed recipes for specific fruits or vegetables are then given, enabling you to put in practice the processing outline. The last chapter, on "Measurements and Preparation of Solutions" gives guidance on essential tasks, such as how to calculate proportions of ingredients, chlorinate water, prepare solutions, and measure the strength of vinegar.